Hadrian’s Flotilla – Zionism and a Free Palestine under scrutiny. Is Hadrian, the man behind Hamas? ISRAEL is a false state and the Free Palestine movement is a false struggle. If we had to measure both the Israeli State and the Free Palestine Movement by the standards of our own democratic revolution, neither side would stand scrutiny. The shortcomings, not just of the Zionist version of democracy, but of the Palestinian version of struggle, are immediately apparent. Whereas the South African liberation struggle had a Freedom Charter guaranteeing all its citizens human rights and took as a departure point, the American civil rights movement, the Free Palestine movement has little to offer in the way of founding documents asserting fundamental freedoms. Aside from the past months humanitarian efforts, the Free Palestine movement has only the political ambitions of Hamas and Fatah for the return of Arab land gained during the Roman occupation (and subsequent periods of Ottoman, Mamluk and British rule), to show the world, — the assertions of the rights of the dispossessed over those in possession of land in a struggle which has been perverted by an infamous covenant setting out the destruction of Israel and its replacement with an Islamic republic. Both Zionism and the Free Palestine movement are clearly the result of delusional nationalism, religious zealotry and the irrational quest for autonomy and self-determination in an increasingly interconnected world. The state we know as Palestine was created in 132CE by the Emperor Hadrian in response to a revolt by Jews under Bar Kokhba. According to history books, the Romans joined the province of Judea (which already included Samaria) together with Galilee to form a new province, called Syria Palaestina. It is this state which emerged out of the rubble of World War 1 when the Central Powers which included Turkey and Germany were defeated by the Allies. Neither the State of Israel nor the State of Palestine however, existed in either their current form, or in subsequent forms, prior to 1948. Both remain unable to guarantee fundamental freedoms and human rights for all. Whether it is the ethnically challenged Knesset or the Hamas and Fatah puppet governments — there is a huge gulf of distrust and aggression between what could be called acceptable democracy and the false democracy we see in the Middle East today. How much of what passes for politics in the region is merely the manipulations of stronger, more powerful states, such as Iran, Russia and the USA? Comparing the South African struggle to the Middle East experience, measuring both states against our competing ideas of freedom, our Bill of Rights, is crucial if Jews, Christians, Muslims, and non-believers alike are to understand how it came about that the sixty-year old “Zionist State of Israel” is now referred to as “Apartheid Israel” while the “Free Palestine” movement is seen by the World’s press as the spiritual descendants and heirs of Nelson Mandela, despite its intended beneficiaries openly calling for the “elimination of the Jewish people”? Unlike the ANC which had a reasonable and acceptable plan to create a majority rule government in which all people were accommodated, Hamas until fairly recently has demanded the creation of an Islamic republic, the dismantling of Israel, and the exile of Jews. Zionism is not merely a form of religious fundamentalism but an attempt to recreate the Hebrew state of Judah before its dispersal in various forms. Both ideologies would appear to mimic each other in terms of their racial and ethnic exclusivity. 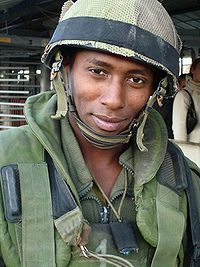 However, unlike the Palestinian example, there are black Hebrews in Israel and about a quarter of a million Ethiopian Jews, many of whom serve in the IDF. It is perhaps easier to attack Zionism in a knee-jerk reaction which equates Zionism with capitalism, than it is to criticise Arab nationalism, Islamic zealotry and the demands of Hamas and Fatah. But if we do not criticise, and instead shirk back from our responsibility, then we run the risk of feeding the grave possibility that any settlement or outcome to the conflict will not be the genuine peace solution so desired — the freedom in a “Free Palestine” – the freedom when we talk about “Freedom from War, Freedom from Want”. In all likelihood the reality will be yet another terrible tragedy in which an artificial government seeks to overcome a false state, albeit an ethnically-based multi-party-democracy, merely by asserting its own peculiar revolutionary but racist ideal, resulting in the inevitable destruction and loss of life on both sides. What is wrong with Israel today? Is it the numbers game, in which an invisible population known as Palestinians (some 11 million if one includes the diaspora) do not enjoy basic human rights? Is it the bantustan policies of the Likud government which reduces Palestinians to guests in their own country and in which the newly created Palestinian entities are turned into client states, literally under permanent siege from the Israeli Army? Again, if the Free Palestine Movement instead of the Anti-Apartheid movement had prevailed in South Africa we would also be found seriously lacking — we would not have a Bill of Rights alongside a federal solution in which provincial government competes alongside national government. We would not have multi-party democracy but a dictatorship. We would not enjoy fundamental freedoms like religious and other freedoms, and we would not have freedom of expression and a free press. South Africa is only one of two sovereign states in the world whose founding documents begin with the words, “We the People.” As a country we have embraced a secular identity while enshrining religious and other freedoms in a constitution. This is no accident. South Africa like other commonwealth countries fought alongside the allies to establish the United Nations, whose preamble also begins with “We the People”. How then can South Africa assist the Israelis and Palestinians in achieving a peaceful solution? For starters, we can brush up on our geography and knowledge of history in the region. There are many Jews who complain they were forced to campaign for the establishment of the state of Israel because of the Nazi Genocide and not simply because of Zionism or belief in the State of Israel as literally ‘G-d’s will”. Such Jews use an argument of necessity to persuade themselves and others that Israel’s existence in its present form is a necessity for survival, in the same way oxygen is necessary for life on this planet. Again, many Free Palestinian activists believe, rightly or wrongly, that it is necessary to destroy Israel in order for the state of Palestine to exist and for the great catastrophe of the Nakba and occupation to come to a final conclusion, in the fulfillment of Hadith. The Nakba refers to the forced removal of between 650,000 and 750,000 Palestinians from Israel when the British mandate ended and the new states of Israel and Palestine were born, a period immediately following World War II. It also refers to the great catastrophe caused by the two states warring against each other, over subsequent years, to the point where the State of Palestine no longer exists in the form decreed either by the British mandate or by UN resolutions. Whereas most Muslims refer to the Nakba within a religious context, the term Nakba was first used in this way by Syrian historian Constanine Zureiq in his 1948 book, Ma’na al-Nakba (The Meaning of the Disaster) as an attempt to counter the moral weight of the Jewish Shoah. This is the great catastrophe which resulted in the murder of 6 million Jews by Adolf Hitler, which by the way included 100 000 Jews from Jerusalem under orders of the Mufti of Jerusalem – Hitlers now infamous Order 30. However shameful, the Nakba does not have the same resonance in the Christian or Secular world as does the Holocaust, and attempts to downplay the Holocaust have tended into the realm of absurdity with a denial of reality. Although both sides have resorted to religious justification for their problems and have ample reason to distrust each other, depoliticizing or detheoligising one struggle or the other hasn’t succeeded either, since the holy land is precisely that, the Holy Land. Free Palestine activists bucking the trend, often refer to the “occupation” in intellectual terms, preferring to put aside religious differences in the interests of an “heroic nationalist struggle” to regain the land of Palestine as mandated by the British and the UN. Ultra-Orthodox Jews on the other hand point to the occupation of the Temple Mount in East Jerusalem by the Dome of the Rock (an Islamic holy site) as evidence that God’s promise has not yet been fulfilled. The issue of occupation, of who gets to claim Jerusalem as the centre of power thus drives all three of the world’s major religions into a frenzy. For every Crusade, there has been a counter Crusade and so it goes. Brother killing Brother in a monotheistic bloodbath created by competing teleologies. Since the time of the Crusades is over, the British mandate of the colonial period no longer exists and the United Nations has proven ineffectual, we must ask some uncomfortable and difficult questions — exactly which state or world are we talking about, which struggle or future are we are supporting, if at all, and why? In the secular context of the 21st century the “occupation” refers to Israel’s illegal occupation of the West Bank, East Jerusalem, Gaza and the Golan Heights, after the war of 1967 in defiance of the United Nations and international law. It may however also refer historically to the Roman Occupation or the occupation of Judah by Ottoman Turks and of Jerusalem by the Egyptian Mamluks during various colonial conquests and crusades. According to the covenant of Hamas, occupation refers simply to the occupation by Israel of the State of Israel. Increasingly, as Israel is seen as the aggressor, and Palestinians as the victims, one finds calls for the total elimination of Israel, in its entirety, a revolutionary war in favour of a Greater Palestine, in other words a general call for the return of the Roman province of “Palaestina” at any cost, which in turn is met by a defence of Israel by Israelis at any cost. The Free Palestine movement thus opens itself to some criticism, that under Hamas, both it and Islam are being cynically abused, since the party does not represent a genuine internationalist and non-racial grouping for a Free Palestine (a struggle for the greater good and for the return of the international order) but rather an exclusive and elitist Free Palaestina movement — all part and parcel of the ongoing Roman conquest and assertion of the Greco-Roman world-view over the entire globe — one may therefore question whether or not, it is the orders of Emperor Hadrian himself which are being carried out to their ultimate conclusion? Doubtless, there will be those activists who believe such a criticism is a little harsh, especially in the view of Israeli fascism, aggression, militarism and the Islamophobia so tragically displayed in the unprovoked attack on a humanitarian flotilla, yet there are still Jews today who refuse to walk under the Arch of Hadrian, since it symbolises colonial conquest and subjugation of the Jewish people. While postmodernists such as Shlomo Sand may question the existence of the Jews as a people (there are also many Jews for example, members of Neturei Karta along with anarchist such as myself who do no recognise the state of Israel) and deconstructionists disentangle the relevance of the 20th Century in the 21st, the current crisis is bringing a medieval fragmentation of the previous epoch. The USA is not the only new empire builder searching to control its surrogate colonies in the Middle East. Turkey for instance has began drumming up support for the return of an empire lost during the Great War as various nation-states and members of the United Nations compete for influence and control in the region. It is questionable whether the nation-state or the United Nations can ever protect us from war, but in a time of global television and internet connections, the idea of security behind borders is in reality, an illusion. The constant hammering out of UN resolutions critical of Israel has done little to quell Zionism or to change governments. In a recent poll by the Christian Science Monitor, 40% of Israelis expressed the strange view that “the Palestine Homeland is in Jordan”. Moreover, South African calls for sanctions without equal demands for concrete steps towards human rights on both sides, has merely emboldened and bolstered the siege mentality. Boycotts of Israeli goods have in turn produced a blockade of Gaza, which in turn has resulted in calls for more boycotts and sanctions. Whereas the South African conflict was in all reality a struggle for the franchise and equality by those who were disenfranchised, the Israel-Palestinian conflict is far more complex. The only equivalent period we have in our country’s history is the Anglo-Boer War, also known as the South African war, in which one half of the country was pitted against various autonomous republics in the interest of a union. Both the need for statehood and self-determination vexed us during the struggle, but since South Africans had already crossed a threshold of statehood as a nation, and calls for a separate “black only” Azania and a separate white only Volkstaat were few and far between, a period in which different parts of the country threatened to break away has already been averted. I therefore encourage Medialternatives readers to come up with their own solutions to the crisis and to avoid the all-out propaganda war on both sides which is merely asserting the politics of a bygone era, an era in which both the United Nations and former colonial rulers, had a degree of clout in the region. Clearly, since so many peace talks have failed, and the two-state options and counter-options have simply drawn out the conflict, the world demands that we put our brains together to work out a peace deal which takes the peace of the entire world into consideration.